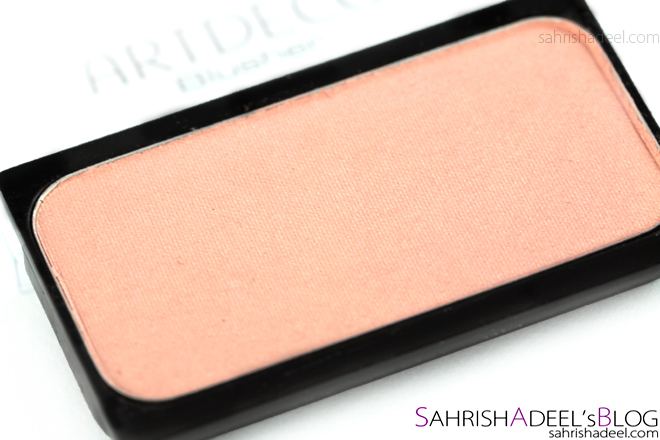 Blusher by Artdeco - Review & Swatch | Sahrish Adeel - Malaysia based Pakistani Beauty & Lifestyle Blogger! A blusher can be a girl's best friend and once it does, there is no stopping in collecting as much as you can. For me personally; I never travel without atleast four blushers in my travel case and for everyday use; I literally mix two or more to give my love to all my blushers equally. Oh yes they can feel neglected! They say: 'Powder blusher in practical magnetic pan. The blushers are available in a very wide choice of shades and separately, and so can be combined individually. This blusher comes in a plastic packaging with magnetic pan and contains 5g of product. The shade I tried is 19 and it comes in over 25 gorgeous shades. The pan is quite sleek and slim hence occupying really small place. The lid slides away as you can see in the photos and is removable making is easy to put in refillable makeup palettes. This particular shade 19 is a beautiful peachy shade suitable for very fair to medium skin tones. This shade is described as rosy caress blush on the website but I could not find anything rosy about it. This swatch has been taken on bare skin and this is the maximum intensity of this shade. From packaging to formulation, I loved everything about this blush. The magnetic feature of Artdeco's blushers and eye shadows make me want to put them on my fridge as magnets. It is such a gorgeous baby-peach shade suitable for all ages but shows on very fair to medium skin tones. The formula is easily blend & build-able but it stays subtle no matter how much you build the shade plus it does not look heavy or cake-y. Even though this is a pretty light shade and light shades tend to tone down faster but this one stays for good six hours on me. This amount can last you for years but it still can be a bit towards the out-of-budget side so as an alternate you can totally go for CSP's Blushers and MUA's Blushers in their The Astiste Collection palette which comes with two blushers, one bronzer, one highlighter and six eye shadows. 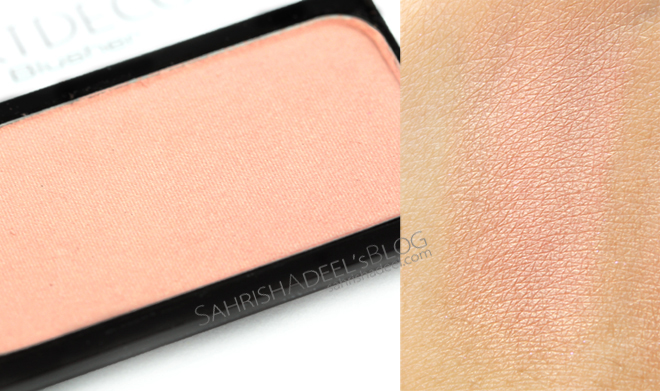 Infact, both of blushers in MUA's palette are very close dupes for this Artdeco's blusher. Overall, I have no complaints with this blusher and I really liked the formula and shade as well. 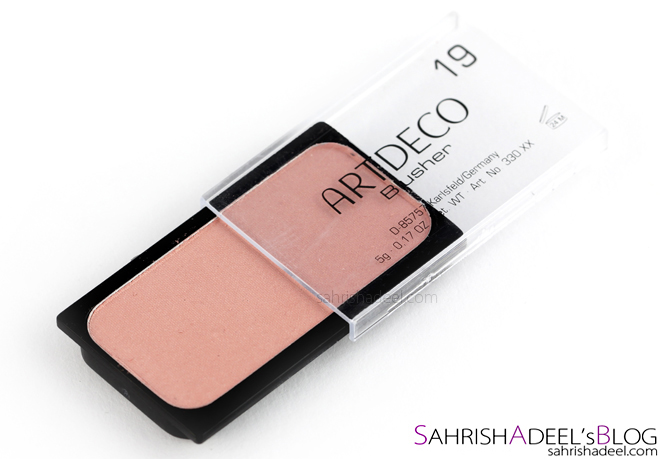 Artdeco Blusher costs pkr 890 and you can find it in all major stores across Pakistan. Join Artdeco Pakistan's Facebook page for more details. You can also buy it online from Just4Girls.pk and they ship within Pakistan as well. For overseas, I saw it costing about $17 online so you might wanna check a few websites before you order it.